May 2017 | Matcor, Inc.
What is the best way to prevent damage to sled anode cable connections due to rough sea current and waves? 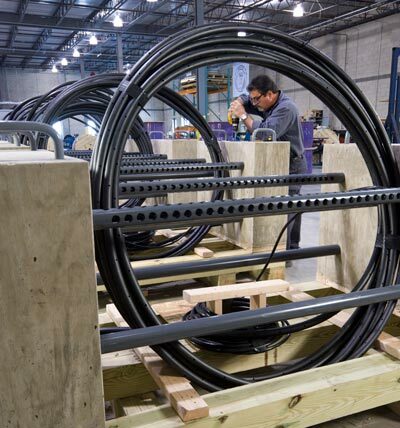 MATCOR marine sled anodes (Sea-Bottom™ Anodes) are designed with the cable connections routed inside a high density polyethylene (HDPE) protective pipe with holes to provide a level of mechanical protection. Then we use concrete weights to help secure the HDPE pipe (with the cable inside) to the sea bottom so that they are not subject to wave or tidal action. The protective housing is pictured here and called out as item 4 on the drawing on page 3 of our Sea-Bottom Marine Anode Sled brochure. For the concrete weights, you can use a variety of methods from sacks of concrete to custom formed concrete cast weights. 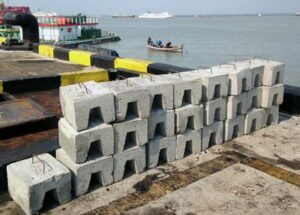 Below is a photo of the weights that were locally supplied to us for a recent project in Indonesia. These weights are installed by divers during the sled anode installation. For assistance with impressed current anode system design, MATCOR’s Sea-Bottom Marine Anode Sleds, project management or installation, please contact us at the link below.